In a time of endless stress and never-ending workloads, finding a place to relax and unwind is crucial for your health. Setting aside some “me” time is a way to recharge, reflect, beautify and detox all at the same time. And one of the best ways to achieve that is to visit a spa center. However, since the reason we need spa time is to minimize the effect of the hectic daily routines, going to the spa centre should not add to the discomfort. All those lines, unknown people and appointments can divert you from the whole experience and make you miss out on so much pleasure. In order to have it all, you should consider investing in a residential 4 seater spa bath which offers the same health benefits as a spa centre but from the comfort of your home. Read on to find out more. Having a home 4 seater spa bath can make your life much easier. You can indulge in some quality spa time whenever you want, and since this spa bath offers more seats, you can invite whoever you want to enjoy it with you. You can bond with your family members or friends in the most relaxing way possible. Besides all that fun, you will also feel a great number of health improvements. First of all, by regularly using a spa bath you will decrease the everyday level of stress. Stress causes headaches, muscle tension, fatigue and soreness. All this can be minimized by some spa time and thanks to the stress relief aspect of it, spa time can also help you with anxiety. Surely it is not a cure, but it can help, and when it comes to anxiety, every little bit counts. 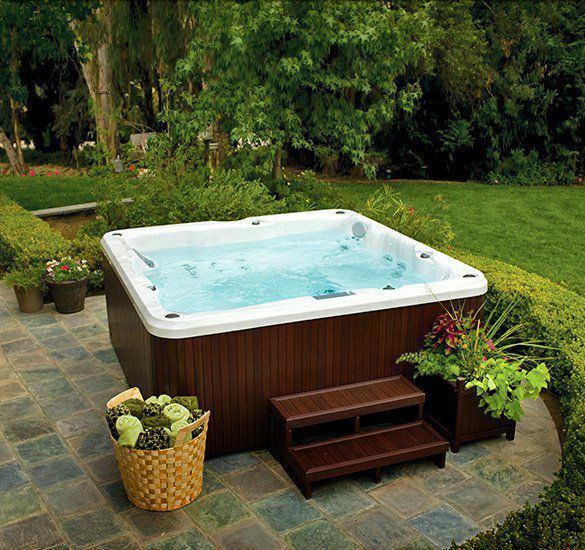 Furthermore, a large number of 4 seater spa bath models come with hydrotherapy massage jets, which stimulate the release of endorphins, which are seen as the body’s natural painkillers. Second, all that relaxation provided from the hot water will enable you to sleep better. When your tense body comes into contact with the hot water, it will raise your body temperature and relax your muscles and you will go to bed relaxed, pain-free and in a positive mood. Moreover, regular spa time can help clean your body. Heat opens up your pores, and, by doing so, it lets the water work its way in and help your skin get cleaner by getting rid of dirt and toxins. This detoxification process will make you feel rather refreshed. Finally, as time passes by, everyone loses the range of motion in different body parts. Regardless of the seriousness of your condition, regular usage of spa baths will help you restore lost flexibility and slow down the natural processes that comes with age. Also, while you are soaked in hot water, you can practice some flexibility exercises and additionally improve your condition. And remember, since the time spent in a spa bath makes you feel good, it will also inevitably increases your self-confidence. Positive thoughts bring about positive life, so don’t miss out and treat yourself.